Minivisions, a label of Choice Provisions, which is originally founded by Jason Cirillo has announced some exciting news for their new Arcade game ‘Woah Dave!’ It will be making its way very soon (possibly as soon as October) to PS4 and PS Vita, which you will be able to get it as a cross-buy title. MiniVisions is a new label, and with the first game being Woah Dave!, they are definitely bringing some smaller games that brings joy, and fun. In Woah Dave! Players will experience an arcade game that brings you back to games of the 1980’s, but coming to the modern day gamer. Take on aliens in the game, while throwing things at them and collecting coins. No price has been mentioned yet for the game, but do expect to have it not pass the $10 mark. Though don’t just go fight against these aliens, try your best score and get the most coins in order to make your way to the top of the online leaderboard. You won’t have to go at it alone though, Woah Dave! 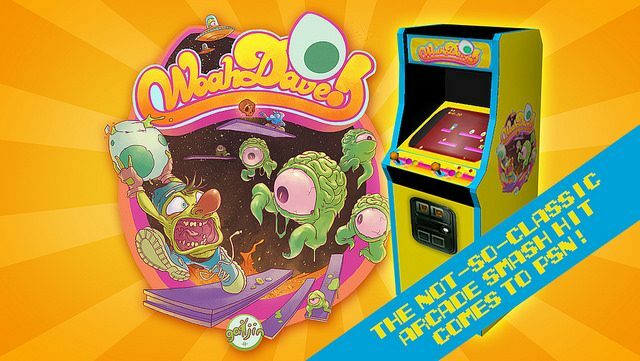 features two Daves that are able to go head-to-head in the two-player competitive mode, but currently it is only available on local and not via online matchmaking competitions. The basic premise is that poor Dave has taken it upon himself to protect the city from the relentless invasion of aliens hatching from mysterious eggs that are falling from the sky. The only things in his arsenal against the creatures are the eggs themselves, as well as some menacing-looking glowing skulls and the occasional WOAH block. Once the aliens have hatched, they instinctively make their way down to the lava pit where they spring up in evolved forms, until they’ve evolved to their final form as tenacious Eye Bats. Dave can toss the eggs at the aliens to kill them, as well as the skulls which act like bombs that explode over time. It’s like a non-stop game of hot potato where your own weapons eventually turn against you! The WOAH blocks are Dave’s savior, as they will clear the board when thrown to the floor, giving Dave a chance to make a clean sweep of the pennies left behind. You can find out more information about Woah Dave on their official site. You can follow Woah Dave! on Twitter.